If TEPCO was a murder mystery series, every story would end on a cliffhanger without a suspect. Long time I believed that nuclear installations' water would be sterile (because of radiation, chemicals etc). But this is not at all the case, fouling is common there, too. For example, we all remember the bad visibility in the spent fuel pools, with flakes floating all around. Can we be sure this was not of biological origin? There have been observed some strange growths on Savannah River Site high active waste for some time. Pro-nuclearists' spin was that these stuffs cannot be biological, but must be of anorganic nature. Now last Thursday a new report was published that these are actually a mix of various bacteria. Please note the similarity of the orangish-brownish color of the stuff they fished from the SRS growth and the Tepco photo Ex-SKF showed above. Some studies about radiophile bacteria state that these leave back orangish residues in their biofilm. When I watched the endoscopy videos, I had to think of this when seeing the mats of orangish stuff spotted all over the scene. It could be either rust, or biofilm, or even both (as biofilm seems to greatly accelerate corrosion according to many studies). Let's hope Tepco will be curious enough to examine the stuff and tell us about their findings! I think the white stuff comes from months of biofilm growth throughout the system. The second stage of biofilm development is known as "irreversible attachment" once settled biofilm is highly resistant to removal. Some biofilms corrode metals and when they do sometimes the colony comes loose and becomes free floating. Some of the free floating masses come from the biofilm's final stage of maturity known as "Dispersion" these large masses of free floating biofilm can become accreted into visible clumps. Something to remember is they haven't been using sterilized water IIRC they were augmenting the decontaminated water with freshwater from a local impoundment. I find it hard to believe the plant operators don't know what the problem is they go to great lengths to control this issue in normally operating NPP's. Does the white goo in this picture look familiar? Corrosion - Anaerobic sulphate reducing bacteria can form and live in biofilm. These produce sulphuric acid which will corrode pipes and can result in leaks. 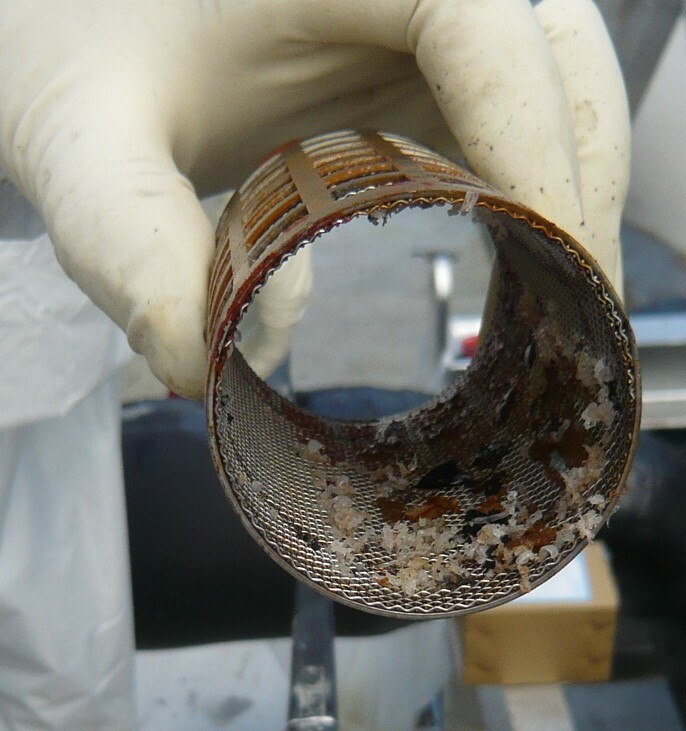 Anaerobic iron-oxidising bacteria can cause serious corrosion to pipes, leading to high maintenance costs and loss of production. Frictional Drag - As a biofilm proliferates in a pipe, it reduces the diameter. This causes frictional drag, pressure drops and a need for increased pumping power. This results in reduced efficiency and increased costs. This paper documents a biofilm episode in the main condenser of a nuclear power plant. The problem was reversed by the use of oxidizing biocide and a wetting/penetrating agent, along with pH adjustments and other measures. All of the factors leading up to the problem are discussed in detail as are the measures taken to reverse the problem. The Savannah River article really got my attention when I first saw it because there is no question something is going on. But what is the difference between their fuel pools and the 20-30 I have seen in person? All fuel pools have water that is virtually 100% pure and is monitored constantly. Maybe their fuel pool is much older and has dead spots? Hmm, good question. What is the difference between the SRS pool and a normal power reactor spent fuel pool? Really would like to know the actual (probably mostly gamma) radiation on those waste buckets where these bacteria grow. I think this is a new quality compared to biofilms in tubes and the like. The Fukushima case is possibly another new quality in this regard, as the life form growing in the monstrous bioreactor tank farm which plagues Tepco thrives in this "purified" water with its tremendous beta activity. Here is a little bit from Germany to add into the SRS site. anon 6:27, thanks very much for the link! I have some kind of nostalgic feelings with the 20-megawatts BER-II experimental reactor, located in the 4-million-city of Berlin, where I also lived. I have participated in the hearings about that reactor, a friend even sued against it, but in vain, after a long court battle. Back in the Cold Ages, the pro-nuclearists planned even to build a full-fledged nuclear power plant in West Berlin. Sadly to them, the impossibility of an evacuation of West Berlin in case of an accident stopped that project. I agree with Atomfritz the aquatics industry uses PVC shavings for bio filters media because it has so much surface area. I doubt the meager amount of material shown in the photos could cause such a major blockage on its own. Here is a few examples of PVC bio filter media.